Dr Foo’s write-up on mini-laparoscopy, as featured in the May 2013 issue of the monthly Parkway-Pantai magazine. 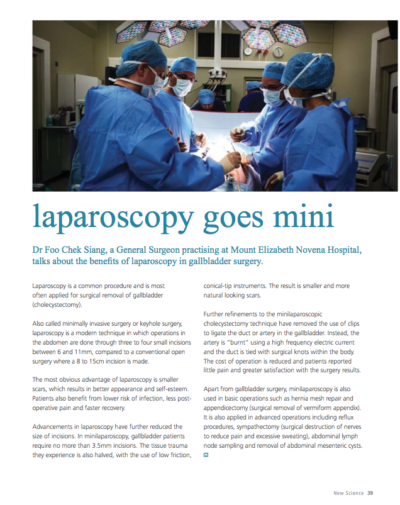 To find out more on how mini-laparoscopic surgery might be able to help you, contact Clinic for Digestive Surgery at +65 6570 2702 to speak to Karen, our Clinic Nurse. Alternatively, drop us an email at doctor@clinicfordigestivesurgery.com.